Four million two hundred ninety thousand pesos—let that amount sink in for a second. That’s the entrance fee to Volkswagen Touareg ownership, especially if you want the Sport Edition pictured here. Is it worth it? Well, that’s a question not easily answered because you can take two points of view. The first is that you’ll look at it as a cut-price Porsche Cayenne because it largely shares the same running gear and platform as Stuttgart’s venerable SUV. On the other hand, if you’ll look it purely as a VW and as such, it costs about a third more than Wolfsburg’s next most expensive offering. Either way, it’s a gross oversimplification of the entire car. It’s neither a poor man’s Porsche nor a rich man’s Volkswagen; it’s got its own unique identity which you’ll only understand if you get to spend some time with it. 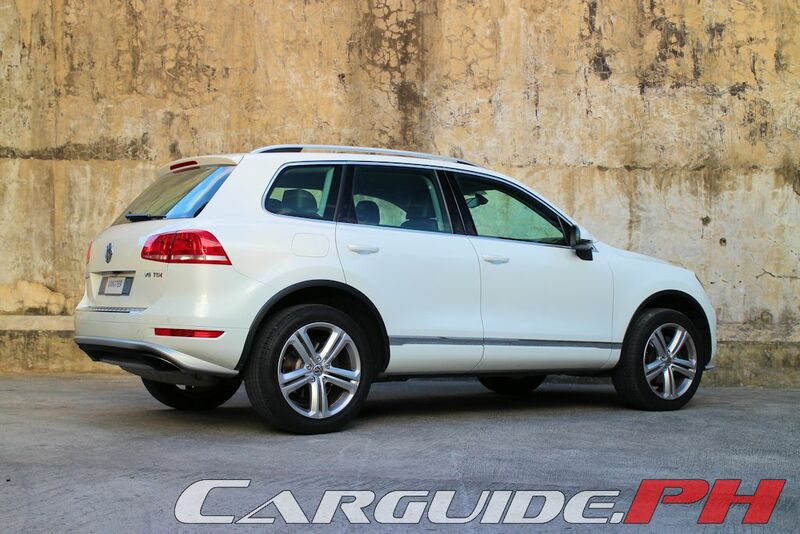 First, let’s get something out of the way: yes, the Touareg does share its basic platform with the Porsche Cayenne. However, the similarities end there. Like having twins with different hobbies, the Cayenne and the Touareg are different inside and out. 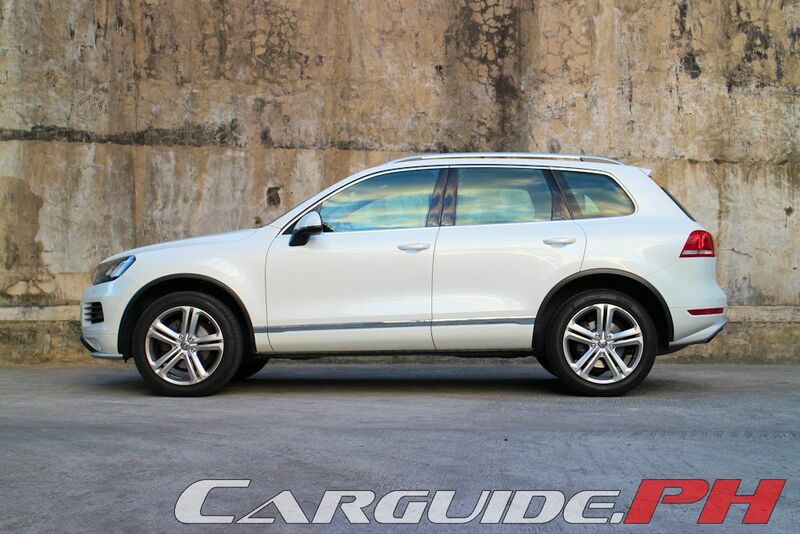 While the Cayenne feels more like the well-chiseled triathlete, the Touareg is more of the adventurer who enjoys mountain climbing and the great outdoors. It doesn’t look it in photos, but it has quietly strong presence. It’s almost like a Secret Service agent: it doesn’t call attention to itself, but once you see it, it’s every inch effective. Most of this is down to its massive width, but even in its lines and proportions, it’s a symbol of Teutonic strength. And adding even more gravitas is the Sport Edition package that bumps up the adrenaline. The revised bumpers and tasty 20-inch alloys with meaty Pirelli P Zero tires give an even more athletic look without reducing the rugged appeal. Strong and athletic as it is on the outside, VW has tried its best to give an upscale feel inside. To a degree, they did get it right. Getting up is literally a hop aboard because of the high step-in height. Once aboard, a whiff of the interior lends to an impression of luxury. And for the most part, it is. The interior design and execution all play the part with its clean horizontal layout and crisp controls. Unfortunately, start poking around in areas like the lower dashboard and seat frame, and the Touareg starts to betray its people’s car origins. Though these areas aren’t primary touch points, the plastics here are the same quality as those in the Jetta or Polo. A bigger crime though is that it doesn’t even offer basic power adjustments to any of the seats. Sure, you can live with a manual tilt/telescopic adjustment on your steering column, but for a four million-peso car? You’ll definitely expect the seats to offer the convenience of power adjustment. Volkswagen’s crime of omission doesn’t stop with the manual seats either. The Sport Edition lacks sought-after luxury touches such as a moon roof and a power tailgate. Personally, neither feature is a deal breaker, but glaringly, the Touareg fails to offer features which have become pretty much standard even in Japanese compact crossovers: a push button engine start/stop and even Bluetooth hands-free telephony. 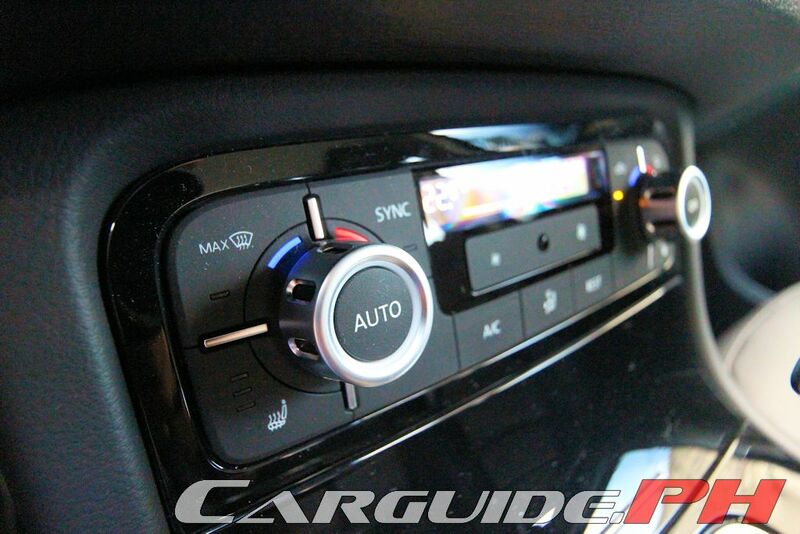 The former is even made more ironic because to start the engine, you slot the electronic key and twist it. There’s no mechanical linkage here. 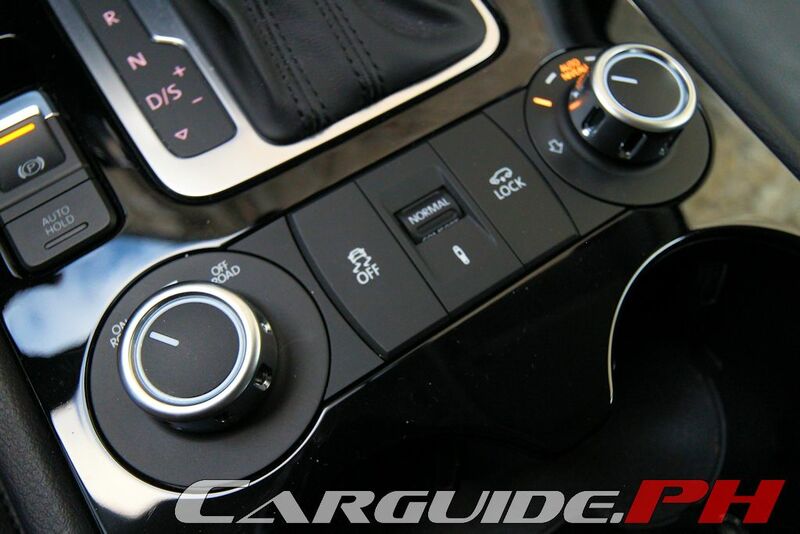 VW could have saved everyone the hassle and just equip a push button as standard. 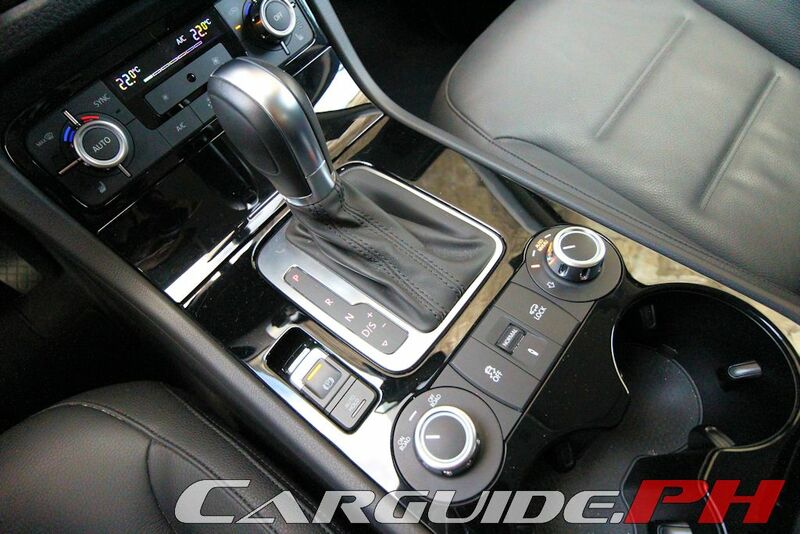 On the other hand, it’s got a four-zone climate control, so it’s not totally empty. 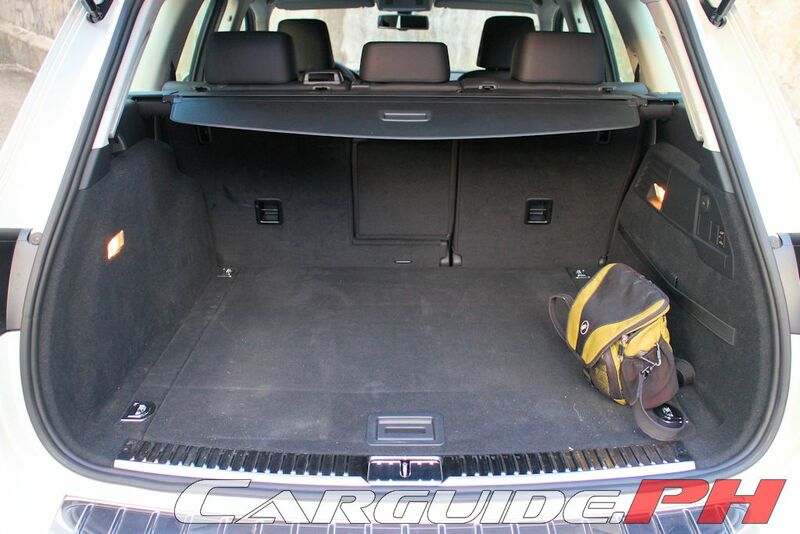 So while you’re getting to grips with the Touareg’s rather weird standard features list, at least there’s no questioning how roomy it is inside. 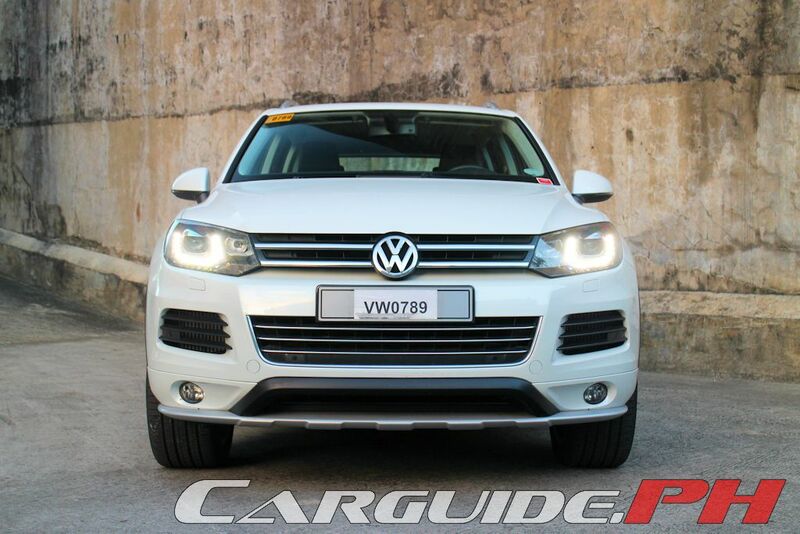 The closest comparison to the Touareg would be the likes of the Ford Explorer or Toyota Land Cruiser, both of which are 7-seaters; while the VW is purely for five. 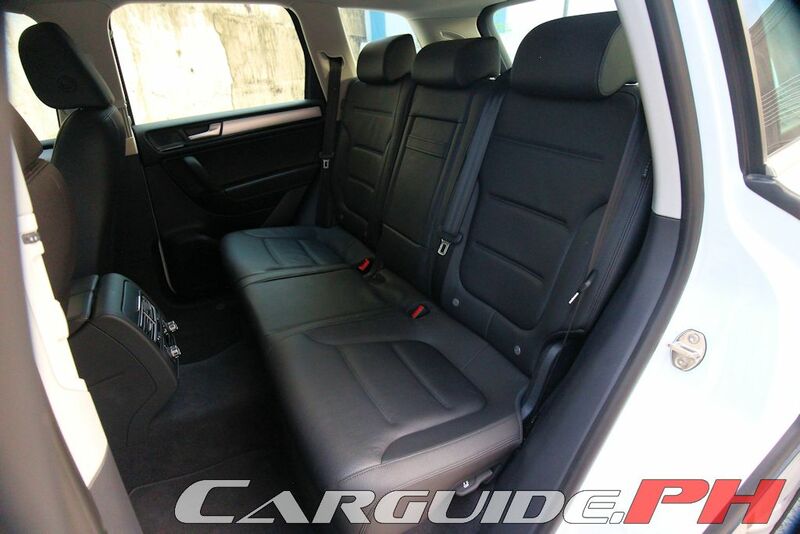 The fact that you can’t squeeze the yaya in the last row is already off-putting for some, but by concentrating on just two rows of seats, the Touareg comes out offering better comfort than its rivals. The front seats are great, cossetting the body in all the right places, providing the right level of support and cushioning that makes even three-hour trip easy-peasy. The same goes for the rear seats with cushions that reach all the way to the end of the hips. Over at the back, the luggage space is already at a huge 580 liters or enough for about three balik-bayan boxes. 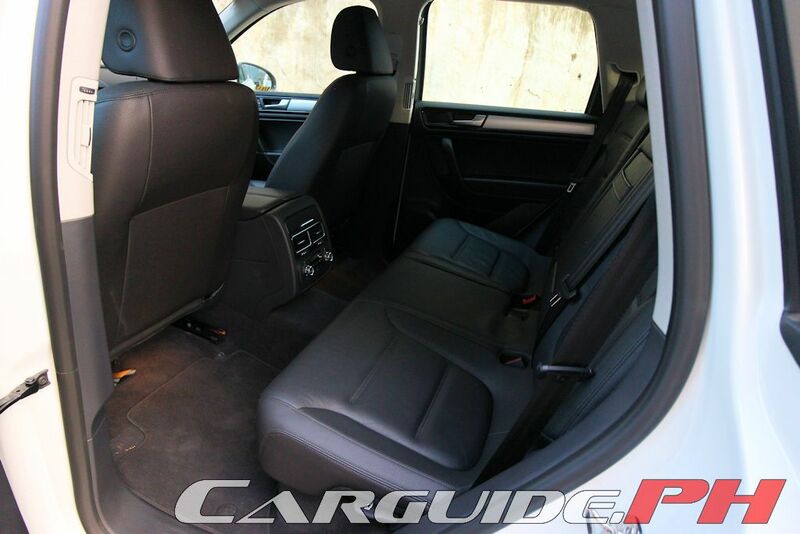 That increases to 1,642 liters or around 10 balik-bayan boxes when the rear seats are folded. Sadly, it doesn’t create a fully flat loading space since the rear cushions bump upward compared to the cargo hold. Still, there’s no questioning which SUV to take on that road trip to Baguio. And speaking of road trips, you have confident power thanks to the locomotive thrust provided by the 3.0-liter V6 TDI engine. This turbo diesel engine produces a healthy 245 horsepower and more importantly, a stout 550 Nm of torque. Putting that into perspective, that torque is similar to that of a Ferrari 458, Lamborghini Huracan, or Audi R8. The result? Despite a 2,256-kilogram curb weight, the Touareg knocks you back, digging you into your seat whenever the accelerator is fully depressed. The 0-100 km/h figure is quick clocking in at just 8.7 seconds, but even more surprising is its effortless passing ability. You never lack steam at any time, with the Touareg making small work of any straight-line. The mighty refined and quiet engine is mated to the equally smooth 8-speed automatic. 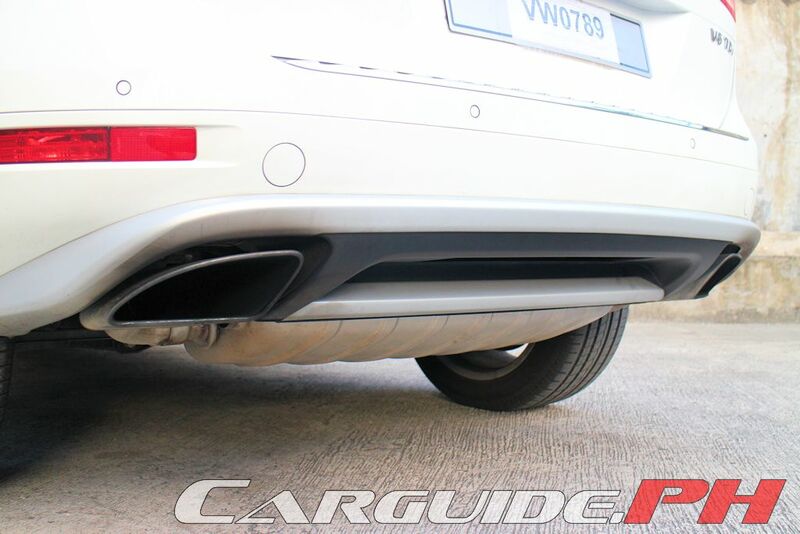 This makes the Touareg a convincing package mechanically. However, the standard all-wheel drive and hefty weight means a penalty in city fuel economy: 6.09 km/L (average speed 16 km/h). 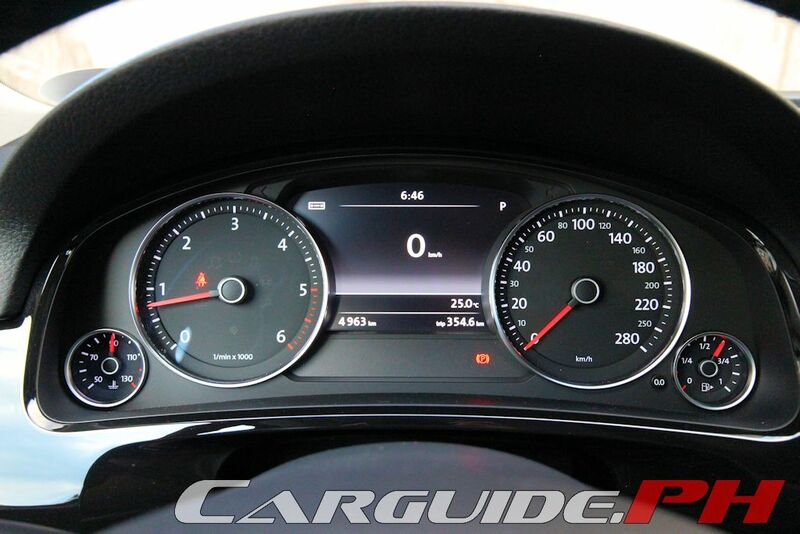 As it gains momentum though, things improve to 14.28 km/L on the highway (average speed 64 km/h). Thankfully, an 85-liter tank is standard so, it can go more than 800 kilometers between refills. 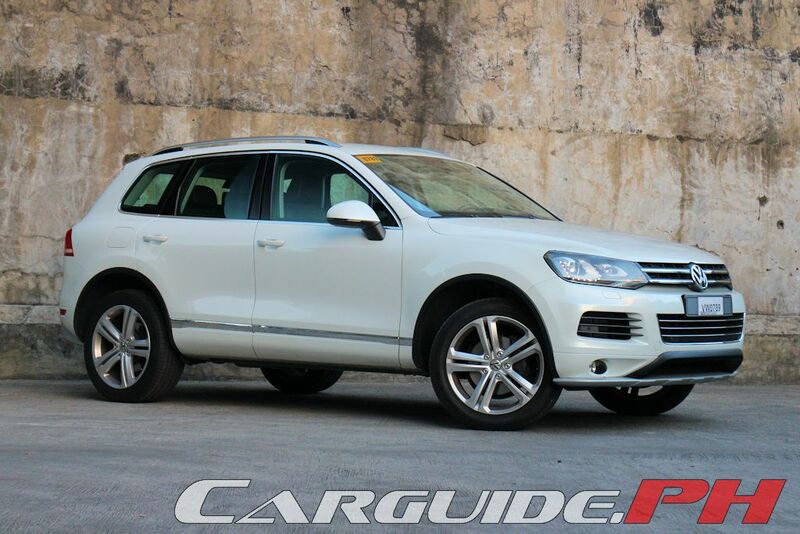 Despite its tremendous straight-line power, there’s no confusing the substantial heft of the Touareg. Even if it’s wearing the ‘Sport Edition’ badge, it doesn’t feel extremely agile or pointable when cornering or executing low speed maneuvering, such as parking. Even with its sophisticated air suspension system, this SUV cannot defy the laws of physics producing noticeable body roll even when you engage Sport on the Adaptive Chassis Control system. Nonetheless, the adjustable dampers do firm up the ride resulting in a sportier feel to the detriment of passenger comfort. The other settings, Normal and Comfort do better to keep backseat drivers quiet. 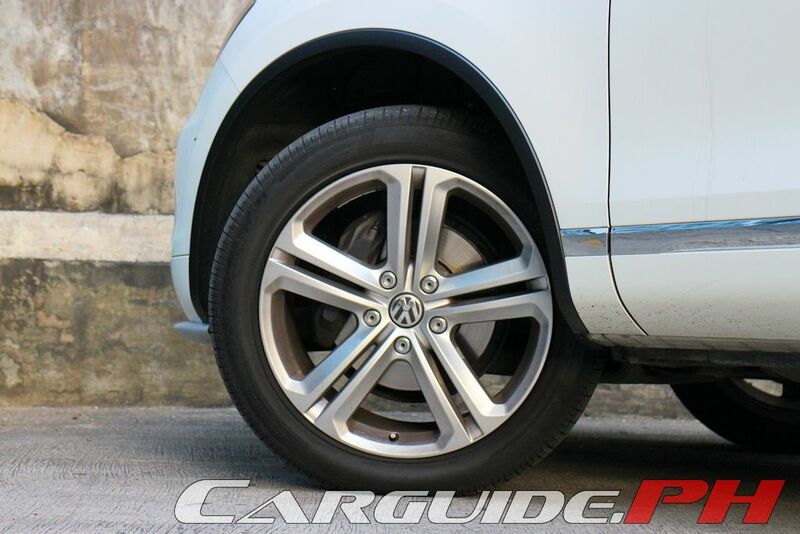 The handiest settings on the air suspension system have to be Off-Road and Loading modes. The former allows you an extra layer of protection when wading through flood while the latter makes loading bulky and heavy stuff easier. Four million two hundred ninety thousand pesos—again, that kind of money isn’t peanuts for the majority of people. For the same amount, you can probably build a decent house. 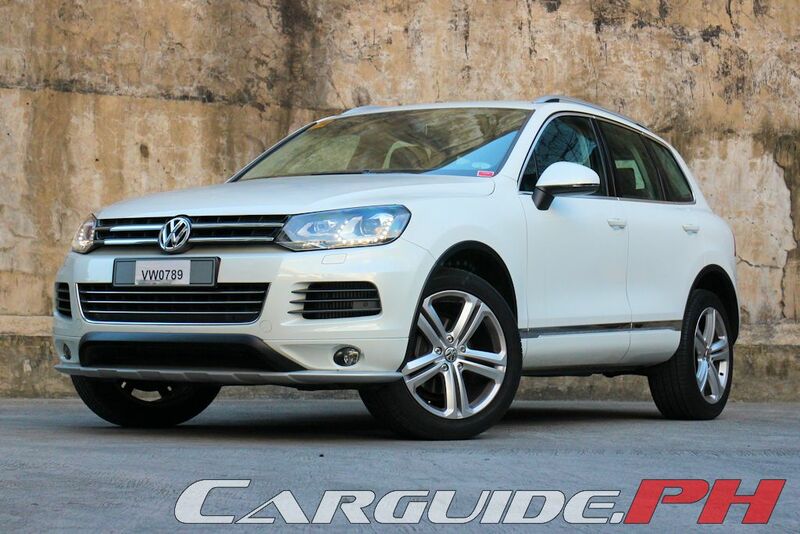 But for the few who can use this money to buy a new car, the VW Touareg is worthy of consideration. The brand may not necessarily have the same panache as true-blue luxury brands, but at least this one won’t call attention to itself. It’s discreet and yet, for the discerning individuals who drive one, they get an experience that’s technically advanced. It’s far from perfect for sure, but it’s not something you should easily dismiss too. It's a shame that the so called "People's car" is not for the common people anymore. I don't know if it's the taxes, or the greed of distributors trying to pass off Volkswagen as a luxury brand, or both. Many people would like to try German cars but they should at least give the same features and toys like their Japanese counterparts. Like the Volkswagen polo for example, at php 950,000 you could buy a Mazda 3, Toyota Altis, or a Honda Civic(cars which are bigger, has more features and better value for money). It would be fine if the Polo comes with comparable Features and toys, but it's not. Volkswagen cars are overpriced, even more overpriced than Honda. People would tend to stick to Japanese cars or opt for the true luxury brands(Lexus, Mercedes Benz, BMW, Porsche, Audi) instead. Volkswagen should decrease their pricing or equip their cars with equipment comparable to other brands. Unfortunately there are at least 2 factors that make the mid level Europeans unable to compete with the Japanese. 1. the unfair tax agreement signed by former President Arroyo granting cars imported from Japan with engine displacement of 3liters and up a ludicrously low rate 2. the Japanese have manufacturing hubs in the Asean region that offers lower labor cost, tax breaks and lower freight cost to neighboring countries. We the consumers are then forced to buy Japanese although we really wanted to try and patronize the Europeans. 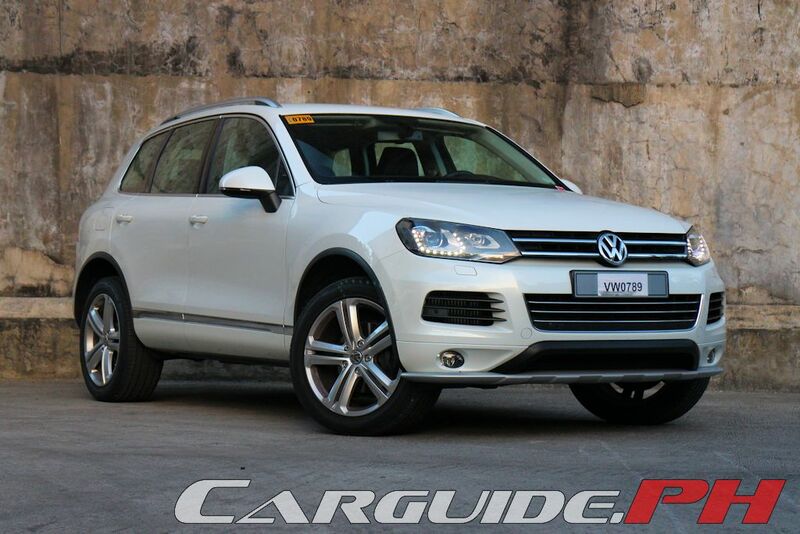 P4,290,000 for a VW... Let that sink in people. This is just as ridiculous as Honda's Legend. The VW is a victim of the reasons mentioned above while Honda Philippines imported the Legend as a image maker, they have no intention of selling it in large numbers, I think they will have no problems of disposing of around 50 units this year, the Ayalas will buy 25 units while the Yuchengcos will take care of the other 25. Did it pass on our level? oh right, were in the PH, where emissions don't matter, traffic lights are mere decorations, and rules are merely suggestions. 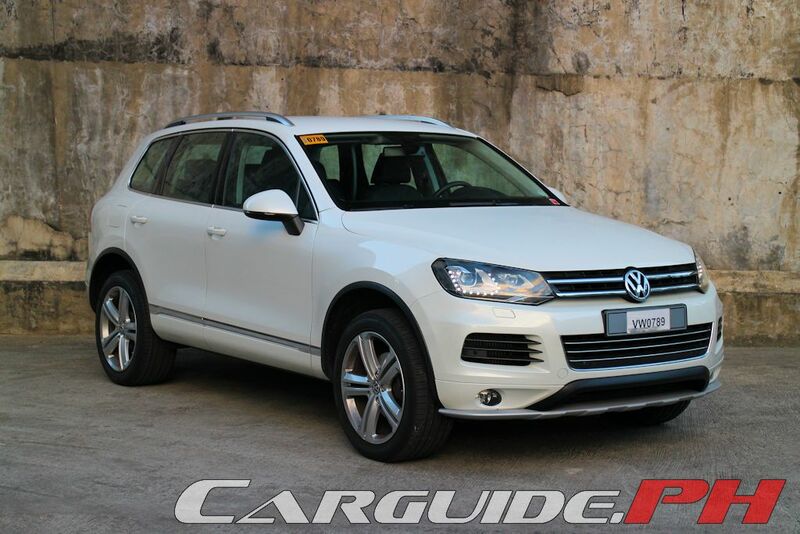 The VW Touareg is a bargain compared to its sister models, the Audi Q7 and Porsche Cayenne. 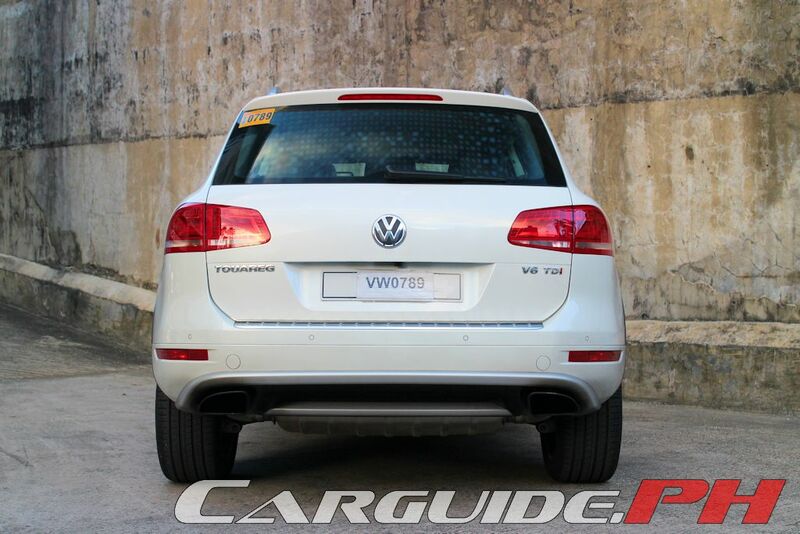 These models are not really the cheap VWs that most Pinoys associate with the VW brand. 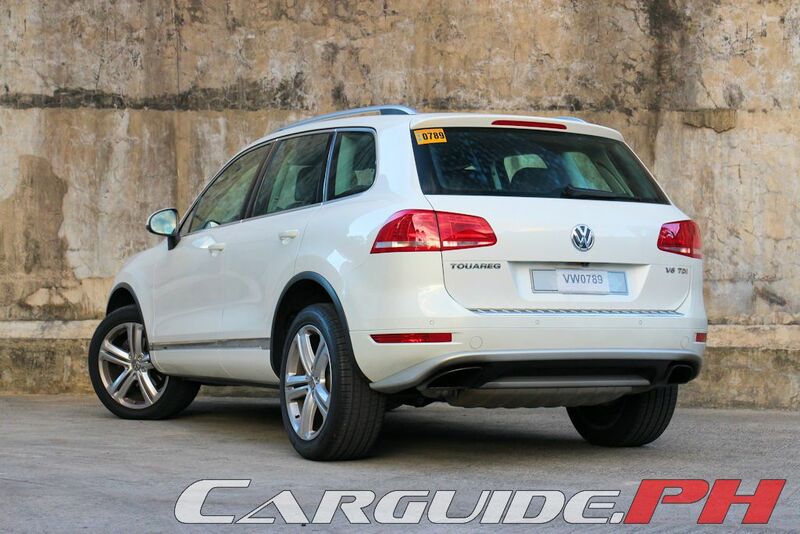 However, VW-PH should reconsider their pricing on their common models like the Golf, Jetta, and Passat. The Golf and Jetta do compete in global markets against the rest of compacts available, the same way the Passat competes against other midsize cars. 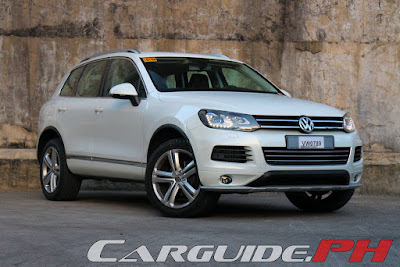 any news when will VW PH release the updated Touareg? The pricing is fair which is cheaper than the Land Cruiser. 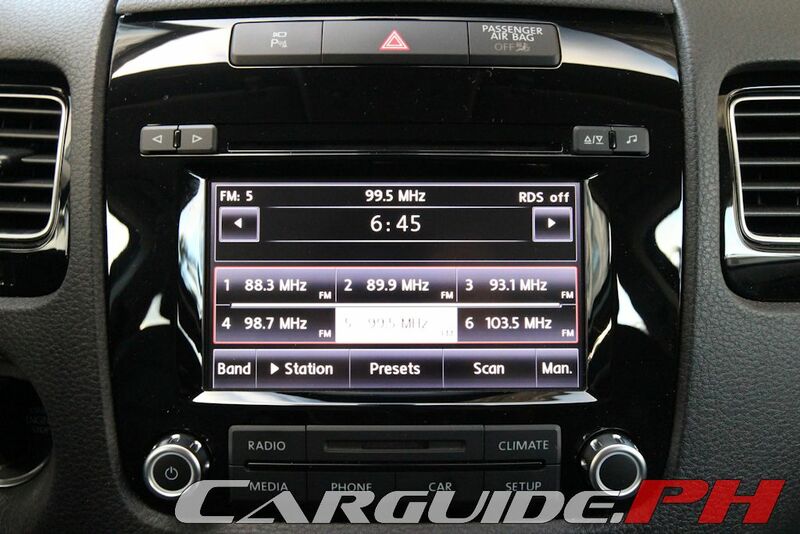 The VW has the advantage in that it is TDI and is probably more sporty on road.